I'll admit I've allowed other things to consume my mind as of late. 'Tis the season, right? I've honestly been struggling with whether or not to continue blogging. I feel lately like I don't have much to share...or what I do share is uninteresting to most. I struggle with the fact that I've stayed at 300 "followers" for over a year. I tried a weekly link-up that failed. I've kind of had the wind knocked out of my sails. Blogging has sort of become less of a passion and more of a...chore? It sounds bad to say that. I love the blogging community. I've "met" so many awesome bloggers and love continuing to read blogs every day. But as for mine, I just feel a little...tapped out. I just need a successful blogger to adopt me and help me grow. HAHA! No, but really, I've just been thinking about this for awhile. I'm not making any decisions until after the holidays. The holidays are full of blog material (for me) since I love to share photos, recipes, etc. But after, I'm not sure. I've always been able to identify with the first 2/3 of the quote because gratitude does make sense of the past and helps to bring peace for the present. 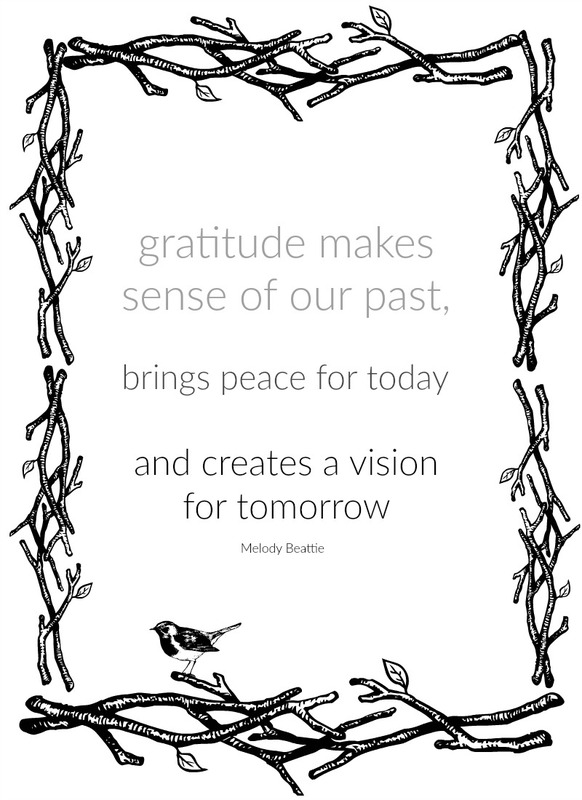 However, I've never thought about how gratitude or a spirit of gratitude could create vision for tomorrow. So in the spirit of gratitude, I will post the things I'm thankful for with relation to blogging and hope for clarity and vision. The people I've "met" and the contacts I've made through blogging. Some of these people feel like old friends and seeing their posts on Instagram, FB and/or blogs really brighten my day. The opportunities I've received from blogging. I've been able to review awesome products and services and learn about new companies. The ability to easily keep my family updated on my life. For someone that's not much of a talker, it's a great way to keep my distant family informed on my life. I'm sorry you're struggling in this space. I used to want to grow my blog and then I stopped wanting to grow it and then it grew. I don't think there's a formula and I don't think I want one...I just want to share what I want to share when I want to share it. I enjoy reading here and I hope you keep going but if you don't, I get that too. If it's a chore, it shouldn't be done. in the month of november, i've gotten a total of eleven comments on nine posts, and only one of those posts got more than fifty page views. i have been blogging for ten years. i have been stalled at three hundred thirty-some odd "followers" for YEARS. i feel you. i completely understand how disheartening this can be. you invest your time. you put yourself out there. for what? i get it. it's so easy to consider throwing in the towel. i think about it all the time. i spent a year doing all these fabulous giveaways on my blog. nothing. in may i celebrated my blog's tenth anniversary with a number of guest posts and games. i developed an editorial calendar thinking that blogging more regularly might get me excited about blogging again (this coincided with the blogiversary bash i'd been doing). i thought putting up snippets of the story i've been writing would be a draw. i started the fall film challenge last year, and yes, it's been more successful this year than last, but still... even that.... ultimately, blogging is a popularity contest. my blog has good content. i write well. and for the most part, i enjoy working on it. there are days it is the only thing i enjoy doing. and then there are days when the last thing i want to do is tinker with something that has so clearly failed. there have been weeks i haven't posted. here's the thing, my friend erin (who is the reason i'm here today... you'd left a comment on a recent post of hers), emailed me and said that she missed my voice in the blogging world. yes, it's a popularity contest. yes, it would be so much more enjoyable if your efforts produced the sort of results so many other bloggers seem to enjoy. yes, it's easy to let the envy sway you to the side of despair. but there's also that one person who favors your presence in this world of virtual friendships. and ultimately, my blog is MY blog. this is what i do well. most of the time i write because i want to put the words down or show of the lovely pictures i've taken. most of the time i write solely for me. show off. not show of. :] but i bet you knew that.